Jennifer L. Young - Dughi, Hewit & Domalewski, P.C. Jennifer L. Young joined Dughi, Hewit & Domalewski in May 2013 as a senior associate. She limits her practice exclusively to all aspects of family law and divorce, including custody, parenting time, alimony, child support and payment of college expenses, equitable distribution of assets and liabilities, adoption, domestic violence, premarital agreements, civil unions and relocation out of the State of New Jersey. Ms. Young also has extensive experience in matrimonial appeals both interlocutory and final. Prior to joining the firm, Ms. Young was an associate in the Family Law Department at Budd Larner, PC in Short Hills, New Jersey. Ms. Young has appeared before Judges in counties throughout the state. Ms. Young received her juris doctor from Seton Hall University School of Law and her bachelor’s degree from Rutgers College. 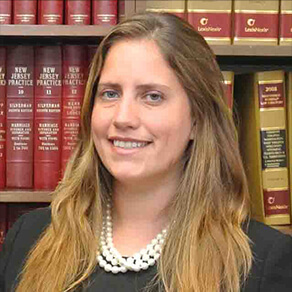 Ms. Young is a member of the New Jersey State Bar Association Family Law Section and the Appellate Practice Committee. Ms. Young serves on the Seton Hall School of Law Alumni Council and is Co-Chair of the Law School Relations Committee. In 2017, Ms. Young was also appointed to serve of the District XII Ethics Committee for a 4-year term.